Grahamstown, Grahamstad or Rini - Province: Eastern Cape (until 1994, Cape of Good Hope Province, usually called Cape Province); District Council: Western Region (previously Albany Division). Additions: Rini (1995). Incorporated into Makana Municipality, 2000. "A rectangular flag in the proportion 2:3, per saltire red and black, charged with a saltire between above and below an annulet, all yellow, and in the hoist and the fly a white escallop". Arms: Or, on a pile Gules, three annulets placed 2 and 1 Or; on a chief Sable, three escallops Or. Crest: Issuant from a mural crown Or, masoned Sable, a plume of three ostrich feathers Sable, embellished Argent, enfiled of an annulet Or. 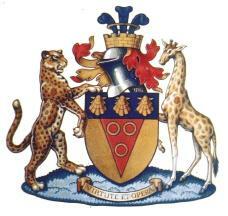 Supporters: Dexter a leopard and sinister a giraffe, proper, each charged on the shoulder with an escallop Gules.